Staat Cuba op je bucketlist? Are you looking for a quiet place and want to avoid tourist crowds? The casa ‘El Delft Azul’ is the perfect place. Caridad (a Cuban) and Ton her Dutch husband are the owners of the house “El Delft Azul”. They live in the Netherlands and rent de house as bed & breakfast. They rent this house / apartment with private entrance, bathroom, kitchen, 1 large bedroom and a small sleeping place for children, living room and terrace / patio and garden overlooking a field full of sheeps, goats and horses. A unique house in the small village of Santa Marta where you can enjoy an authentic cuban village. The house is a fantastic place for 2 adults and 2 kids (in other places 4 pers. need to rent 2 rooms here for pay for the whole house 30CuC). (air conditioning only in the large bedroom). In the bathroom you can find a hairdryer and in the sleeping room a safe-deposit box. At the small sleeping place for children you find a chemical toilet. 5 minutes cycling to the beach of Varadero, one of the most beautiful beaches of Cuba. There you can find many others tourist attractions. ‘El Delft Azul’ is runned by David R.Martinez Llanera y su esposa, cheerful and very helpful people who live close to the house. Languages: Spanish, English. Call for info or send a message in Dutch, French and German (Telephone 0653674903). It is also possible to rent 2 to 3 bikes for your entire stay and beach towels (100X180 cm). (Prior deposit that will be returned when leaving the house). Price: 20- 30 CuC (30 CUC only in case of 4 people). If you stay longer than 5 days after day 5 is only 20 CuC per day. David and his wife can help you also organise salsa and Spanish lessons and finding the best restaurants in the area. Our neighbour Ignacio leaving 20 meters from our house offers taxi services from and to Havana, Trinidad or Varadero (mobile phone: 53291069). David and his wife prepare daily breakfast on the sunny terrace or in the garden nearby and if requested halal meals (Telephone: 58035114). If you need a guide we can also arrange one for you in Dutch/English or French. 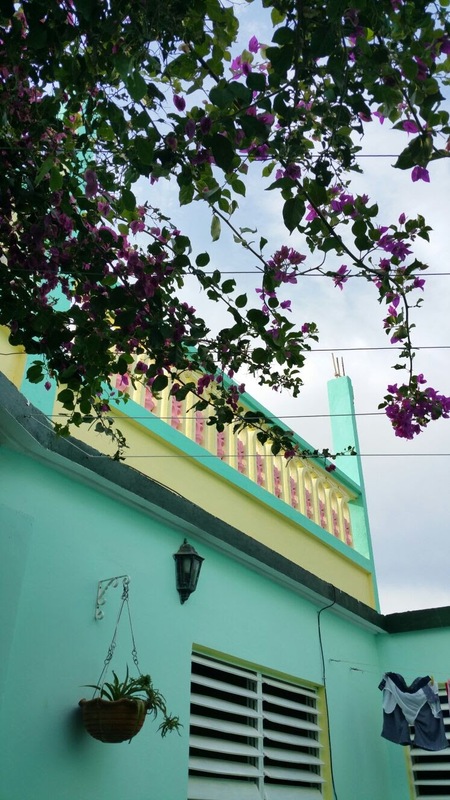 We have been to the house of Caridad and Ton and it was a great place to stay! At first we came early than planned, so Grisel and Luis (the ones who take care of the house) were still making the house ready for our stay, but it was no problem for them we came early. Grisel and Luis are very friendly and are willing to help you with whatever you want. The town of Santa Marta is really nice and not too touristic. If you love to see Varadero but don’t want to stay in the overcrowded city, Santa Marta is a great escape! We stayed at the house of Caridad and Ton for 3 days and 2 nights and had a car we could use (and park safely in front of the house). By car it’s easy to go to Varadero, but by bicycle it’s as easy as by car. The owners have two you can use if you would like to. The house is fully equiped with the stuff you need. A good working fridge (with freezer included), hair dryer, microwave and last but not least a boiler which provides you with warm water in the house. We really loved the coziness of the house with the nice rooftop terrace and patio, located near the centre of Santa Marta Varadero and many restaurants where you can eat well around. Thanks so much to Grisel and Luis for their hospitality and to Caridad and Ton to provide us the house. Some days are gone, but we like to think about the very good stay for the beginning and the end of oure cycle-trip around cuba in this house. Many greetings from Berlin for you Caridad and your neighbour Claudia. The owner is very nice , helpful and easy to reach via email. And if you want to know anything about Cuba or places to visit she is the one to go to. Simply amazing knowledge. In the morning you can either make your own breakfast (bread is provided by the “bakery on the bike” just listen for the bell in the morning or the neighbor can make you an excellent one. The neighbors are caretaker of the casa, this makes the casa very private but help is conveniently nearby if you do have a question. The direct neighborhood can also provide you with a (Havanna airport ) taxi service (either in a classic car or in a slightly more modern one ) just ask around, everyone is very helpful. It is a bit off the beaten track but that is also the charm of the place. Take the bike and tour the island. Visit the bat cave, go to the marina, explore! At the beginning of the evening, take a walk to the main street of the area and try all the food stalls. They are great!!! Horse, Bikes and the Real Cuba! The best house ever! For the price you get a whole home it has the best bathroom with a new toilet, great kitchen new fridge and the water is clean but we bought bottled water at the Market the best one is across the street from La perrilla restaurant or go to the mart at the gas station. We ate out for lunch and dinner and breakfast was served every morning by the fabulous Grisel and Louis they live next door. You eat outside in the little courtyard on these rocking chairs and Luis bought a little folding table, it was so relaxing. Breakfast is always even at our other place: fresh fruit juice, eggs, meet, cheese, tomatoes and a plate of fruit and bread! So much we saved some for afternoon snack and left over juice we mixed in some rum for early evening drinks! The bed is comfy enough and during the day it was hot and at night the temperatures would drop. There is a fan and air conditioner if you need one though we never needed it. You are living in a Cuban town with Cuban people it’s an amazing experience. The families, the houses, the dogs– everyday a person on a bicycle or horse and buggy will come by selling egg, fruits and vegetables. The bicycles were key if you are adventurous and don’t mind a seat that swivels here and there you can go anywhere we had a blast. We rode 20km all the way to the end of the peninsula of Varadero and back, the beach is right over the bridge. Head right out of the house ride along the dirt roads with everyone else, go to the old airport airstrip make a right ride all the way out to the end you will pedi bikes and classic cars that are taxis. cross the road everyone does it and ride past the roundabout and cross the bridge. Make the first exit on your right and it’s a fun curved road down and it loops by the canal where people fish and go under the bridge (this is all very quick) you will come to a T in the road– to the left is Varadero and to the right is Varadero! The first public beach is right across the way. Or you can go right and take a left anywhere and explore. We are from NYC so for us bike with traffic but it’s not traffic it’s a few cars and busses and truck was not a problem for us. We even rode along the autopista to coral beach though we don’t recommend the beach was a bit sketchy. If you arrive on a Sunday maybe the neighbors will invite you to a little roof party on the conjoined roofs and hang with their musically talented friends and their children over drinks. The town is developing and there are little restaurants~ but it’s safe. You are left alone and no one bothers you when you are out and about. Oh there’s a living room with flatscreen tv with cable but even then there are only 4 channels– we wanted to see what Cuban TV was! 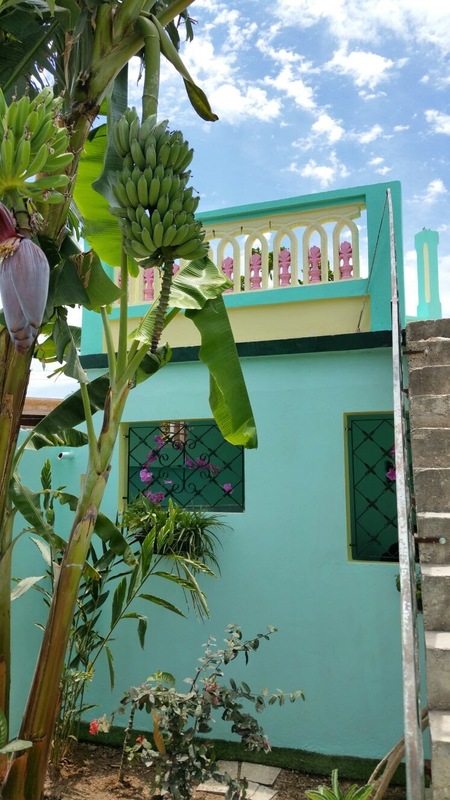 We loved our stay– my partner enjoyed even sweeping the tiles everyday and there’s a great little garden with a banana tree. If you into off the beaten path and want a little adventure this is for you! If less adventurous that is ok too the neighbor can hook you up with a taxi anytime~ and we even had Caridad arrange a taxi (who is a neighbor) pick us up from Jose Marti so we didn’t have to think:) Also Caridad is an excellent communicator and always with a quick response. This home is in a community where everyone helps each other and knows one another is was a fabulous experience. El Delft Azul is a basic but nice house. It has eveything you might need in Cuba. 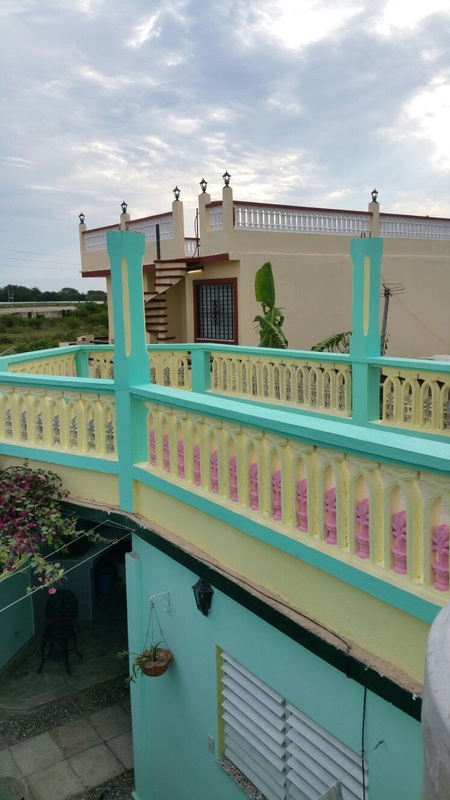 The house is located in a village 1.5 km from Varadero and away from tourist crouwd. You can leant 4 bikes for the whole stay without having extra costs. With the bikes you are on the beach within 5 minutes. The house has 2 nice terraces and garden. The neighbour Grisel and Luis are very friendly and give you advise on everything. They can prepare breakfasts and meals. The rooms were clean and comfortable. If I go again I will definitely stay there. The environment in a village is nice and you also find restaurants there. One of them (Supermachi) you can eat from 1.5 CuC already and there are also bars, banks, shops, market in case you don’t want to use the bikes or walk to Varadero. If you don’t want to spend much money it is an ideal place. Nice casa. Very clean and with a woundefull patio. The owner is very heplfull with everything you need to know about cuba. I’s a great place if you want to stay a bit away from all the touristplaces. Wij logeerden enkele dagen in casa ‘El Delft Azul’. Wij hebben genoten van het huis. Fietsten naar het strand, liepen door het dorp, aten in verschillende eethuisjes, kochten fruit bij de stalletjes in het dorp. Het was of we even op Cuba woonden. Heerlijk. Een aanrader. What a lovely place this is! The casa is new and spacious with a tasteful decoration. There is a nice garden and terrace with both sunny and shady areas underneath beautiful plants. You can see these people paid a lot of attention to their casa. We thought it was nice that Varadero is close by and easy to reach (for the dutch people: by bike ;)) but that the house is also situated outside the touristic area in a quiet but safe area. Also the beach is nearby! Actually there was nothing we didn’t like on this casa. Highly recommended! It was very nice and cosy in your “Casa”. It was clean and the air conditioning was fine (36 degrees). In the morning we enjoyed breakfast on the terrace in rocking chairs. We are warmly welcomed by Isela and…… she has a swimming pool !!! She told us where we could find shops and restaurants in Santa Martha (walking distance). The beach was near and with your bikes or a taxi we were fast in Varadero, with numerous restaurants and entertainment options. Gracias por su hospitalidad Ton y Caridad !!! Dit is echt een unieke casa. !Het is een aparte appartement met een geweldig patio. Een groot ontbijtbuffet wordt elke ochtend in dit prachtige terras die gewoon heerlijk was geserveerd. Isela is echt aardig en ons het gevoel gaf zeer welkom te zijn. Lovely place near the sea. Just a few minutes away from al the tourist. Good place with friendly poeple around. Must Go!!!!! Looks amazing!!! Great Hart & Home you made Guyz!! Verblijf in een accommodatie van Nederlandstalige eigenaren, waar ook ter wereld. Ontdek nu!